Therasauna is a high end infrared sauna manufacturer which has been manufacturing these cabins in the U.S.A. for over twenty years. 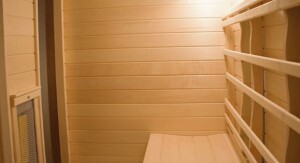 When you buy Therasauna, you buy a complete package that addresses alot of different issues with features that go beyond the type of emitter (ceramic), the type of wood used in the construction of the sauna (aspen), the micron output (in the beneficial 9.4 micron range), where it is made (USA), and the standards under which it is approved (CSA, CE), but it is a whole package deal that encompasses even more. The patented Touchview control is the cornerstone to the patented system which itself has been around for over sixteen years. The controls allow the cabin to heat to produce 9.4 micron infrared output for the duration of your sauna session. The micron output is controlled by controlling the amount of electricity going to the solid ceramic emitters. Additionally, the sauna can be personalized with the MPS – micron power select – control by allowing for individual adjustment of heater sections in the sauna. If the emitter on the bottom is too warm for the ankles, simply go to zone 3 and tone it down to reduce the intensity of the heat for individual control. You can personalize the sauna to your liking. Nobody else in the industry can offer this degree of customization. There is also relaxing mood music or bird chirping included in the control system along with a 7 day reprogrammable timer, so you can have the unit come on at say 7am so it is available and ready to use when you are. There is a “his and hers” feature, so there can be 2 sets of on times programmed. The type of wood used in the main line is aspen wood which is non-toxic in contrast to cedar that can gas-off certain toxins such as found on a cedar hope chest or drawer that gives off a natural toxin or terpin which is an insecticide and ideally not what you should be sitting in. The solid bench which is a curved park bench on one side or a flat bench on the other side can be turned to the side you prefer. The bench is solid and may weigh more than some cheap infrared sauna cabin walls on its own. The aspen wood main line Therasauna is made right here in the U.S.A.
Therasauna accessories include a light therapy system, stereo music system (AM/FM/CD) and aromatherapy as well as additional backrests and footrests, magazine rack and cup holder. New for this year is the affordable Therasauna classic line that is made from lower priced hemlock instead of aspen wood, a simpler yet effective control system and other reduced features allowing for a low price point, entry level Therasauna model for anyone. For a relaxing lifestyle, buy a Therasauna. There are a wide variety of infrared sauna models on the market; from those that hail from across the seven seas including Korea, China, Taiwan and Vietnam to those made right here in the United States. At Hot Tub Outpost we also offer infrared sauna blankets, domes, suits and capsules – almost any way to gain the benefit of infrared in one form or another. With over 30 years of experience wholesaling and retailing infrared saunas and products, the folks at the Hot Tub Outpost have the experience to offer the best products at the best prices to fit your budget. Our selection is unrivalled and we offer free shipping on dozens of infrared sauna models to anywhere in the continental U.S.A.
Saunas are delivered in sections including a back wall, front wall with glass door, side walls, floor, ceiling panel and bench. They either buckle together or bolt together with included hardware. Usually all that is needed for assembly is a screwdriver or included allen key. Easy to follow assembly instructions are included. Those in the 45-60 year old range especially enjoy some of the health benefits that go along with owning an infrared sauna. The infrared sauna will get rid of impurities and toxins from the body through deep sweating induced by the calming infrared heaters. With the warmth of the sun, yet a comfortable ambient temperature compared to the much higher temperatures found in traditional saunas, the many benefits of infrared can be enjoyed in any home. Therasauna is the high end infrared sauna that offers the patented control system for constant, stable infrared output. A new more affordable Therasauna Classic line also offers the same benefits of constant infrared output but in a budget minded model made of hemlock instead of aspen wood and with a simpler, yet still effective control system. We also offer the Far East infrared saunas at low, low prices as entry level models priced around a thousand dollars depending on the model size and number of infrared heaters. Infrared saunas can be accessorized with light therapy, aromatherapy and extra backrests or footrests as well as towels and cupholders. There are even AM/FM/CD/MP3 players available. 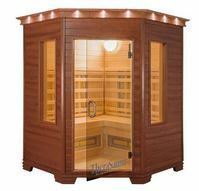 See the current lineup of the best infrared saunas at Hot Tub Outpost. Far infrared comes from the sun and is the healthiest and most beneficial ray that comes from the sun. If you look at the light spectrum, we are not producing gamma rays, x-rays or uv-rays. The studies and reports will say that the vital rays your body has use for is from 4-14 microns or some studies will say 5-15 microns. If you look at the light spectrum, this is a small range, but is the most beneficial. The 9.4 micron output will penetrate the deepest in the human body (1 1/2 -2 inches deep) and resonate and break up the water molecules. 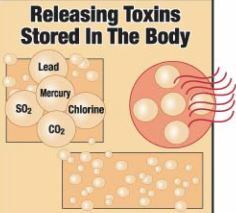 Another reason that 9.4 microns is the most beneficial is that the human body produces this all the time. So this is the level that resonates best with the body. They can see you with night vision glasses because the body produces 9.4 micron output which is in the infrared spectrum. If your body produces at 9.4, you will receive it best at 9.4. 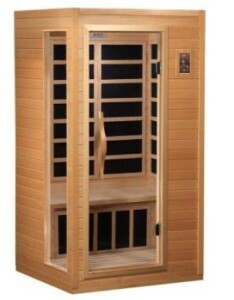 The far infrared sauna cabin can be setup almost anywhere in the home and plugs into a 120 volt power outlet. The resulting sweat output happens at a relatively lower ambient temperature than traditional hot rock saunas and without any steam. This is a dry sauna but the toxins released from the body through the sweat output is up to 5 times greater than from sitting in a much hotter traditional sauna. Several benefits of infrared saunas include detoxification and sweating out impurities, relaxation, increasing blood flow and whole host of other health benefits. See our video on the health benefits of infrared saunas and Therasauna. In the last few years, the amount of EMF (electromagnetic field) from any electronics and electrical wiring is a concern. EMF can be measured with a gauss meter. If you put a gauss meter near a Therasauna, the EMF are very, very low. This in contrast to some infrared saunas on the market that use plastic type heaters (solo carbon) with wires running in the sheets of plastic – basically a wall of electricity – of course these give off very high EMF readings. Therasauna has very low EMF, especially compared to other infrared saunas on the market. There will always be some residual EMF, but nothing like the higher readings from solo carbon type heaters as well as other infrared sauna setups. 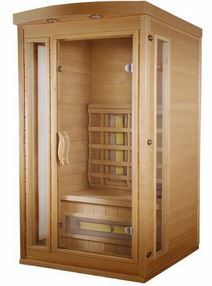 Get free shipping on Therasauna and the new Therasauna Classic infrared saunas from Hot Tub Outpost USA.